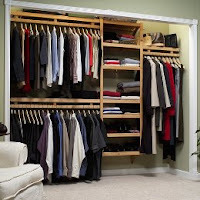 SANITY FAIR: Closets: Splurge or Steal? There are few things that make me happier than walking into a perfectly ordered closet (note the phrase "walking into" - small closets are a major happiness drain). Other rooms that always bestow joy when well-ordered are laundry rooms and offices. My philosophy is that the more unpleasant or repetitive the task you usually do in a room, the less reluctance you'll feel if you're well prepared. Remember reading the Little House books in your childhood? When Laura grows up and gets a home of her own, These Happy Golden Years describes her pantry in loving detail. At 12, I may have had no idea how to can peaches, but I envied Laura her perfectly aligned shelves and copious cupboards. So how do you get great storage? Easily, if you have a large pocket book or a lot of time. For the other 99% of you, I bring you, Closets: Splurge or Steal. 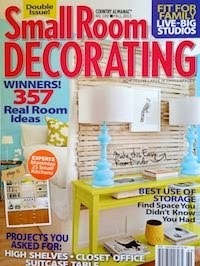 SPLURGE: Birch and White Elfa Decor system from The Container Store. This system runs around $750, depending on the elements you chose. Great for reach-in closets, and easily customizable. STEAL: John Louis Standard Shelving System in Honey Maple, from Target. $264.99 (with an additional 15% off when ordering online). It's a well thought out design and made of quality wood. Now I know SOME of you are still eyeing that cheerful little Elfa closet and sighing inwardly... know what the difference is? Paint! What's cheap and easy to do? Paint! So grab a $25 can of your favorite punchy shade, and attack those walls. 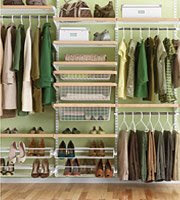 Install your new organizing system, arrange your hard shopped for lovelies, and enjoy. You've earned it.